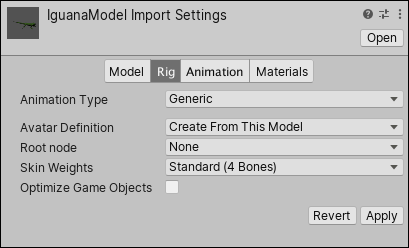 The settings on the Rig tab define how Unity maps the deformers to the Mesh in the imported Model so that you can animate it. For Humanoid characters, this means assigning or creating an Avatar. For non-Humanoid (Generic) characters, this means identifying a Root bone in the skeleton. Generic Use the Generic Animation System if your rig is non-humanoid (quadruped or any entity to be animated). Unity picks a root node but you can identify another bone to use as the Root node instead. Generic Animations do not use Avatars like Humanoid animations do. Since the skeleton can be arbitrary, you must specify which bone is the Root node. 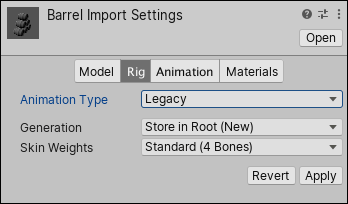 The Root node allows Unity to establish consistency between Animation clips for a generic model, and blend properly between Animations that have not been authored “in place” (that is, where the whole model moves its world position while animating). With rare exceptions, humanoid models have the same basic structure. This structure represents the major articulated parts of the body: the head and limbs. The first step to using Unity’s Humanoid animation features is to set up and configure an Avatar. Unity uses the Avatar to map the simplified humanoid bone structure to the actual bones present in the Model’s skeleton.